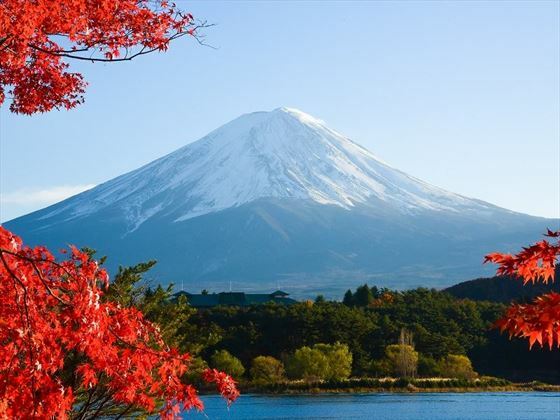 This escorted tour is a wonderful way to experience all the highlights of the fascinating country of Japan. 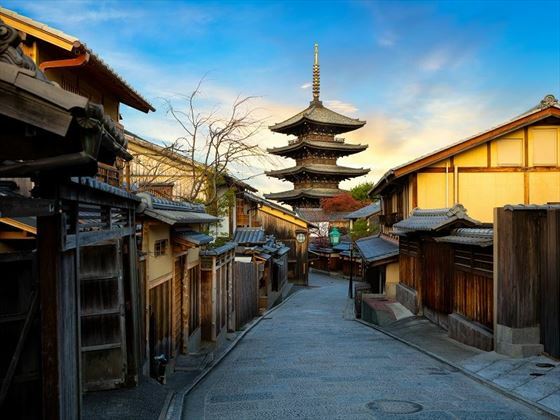 You will have a full programme of sightseeing and experiences, sampling the local food, learning about the history of Japan, experiencing the local customs and taking time to admire the spectacular scenery of this country. It is a small group tour with a maximum of 26 guests plus a dedicated Tour Director. A variety of feature meals are included, such as learning to make sushi, a regional meal of the renowned Hida-gyu beef and a kaiseki lunch in a traditional ryokan home near Kyoto. You’ll also enjoy a Welcome Reception at the beginning of the tour to get to know your fellow travellers and a Farewell Dinner to swap photos and stories (TT). Fly to either Tokyo Narita or Haneda International Airport and transfer by airport shuttle to your hotel. This evening you will join your Tour Director and fellow travellers for a Welcome Reception with drinks and local appetisers. 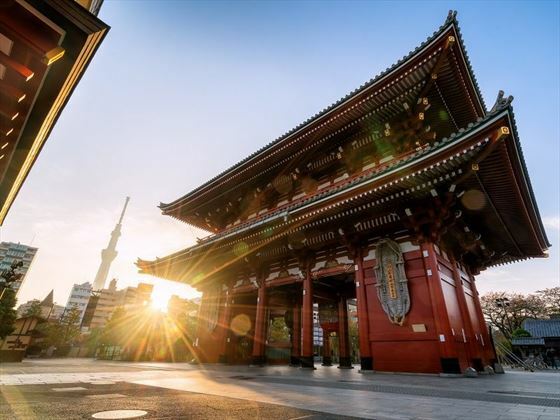 This morning embark on a city tour beginning with a visit to the Sensoji Buddhist temple – one of Tokyo’s most colourful temples which has been rebuilt countless times since it was founded in the year 628, making it Tokyo’s oldest temple site. Visit the shopping street Nakamise, 200 metres long stretching from the temples outer gate to the temples second interior gate. Visit the Tokyo Skytree, the worlds highest free-standing broadcasting tower. Later you can return to your hotel for some leisure time or choose an optional experience. Head to the Imperial Palace Plaza, where there are viewing areas for the Imperial Palace – the primary residence of the Emperor of Japan. Stroll around the Imperial Palace East Gardens, before continuing on your city tour with a visit to the Edo-Tokyo Museum, filled with artefacts and architecture from the Edo period. Next head to the famous Ginza district for a hands-on cooking class, when you will learn to make sushi and then eat it for lunch. 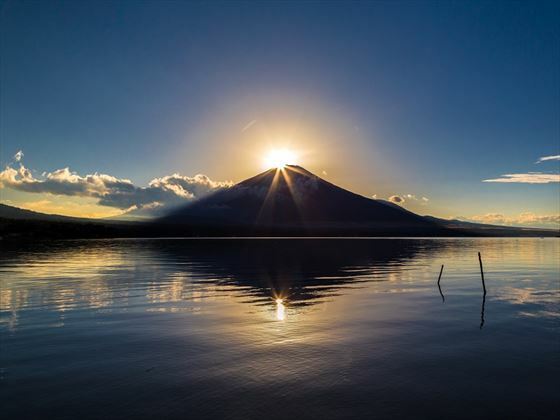 After lunch leave Tokyo and head to the Five Lakes District, dominated by Mount Fuji – Japan’s highest mountain and UNESCO listed. After breakfast visit Oshino Hakkai, a small rural village and a UNESCO World Heritage Site, boasting a beautiful park with natural spring water ponds fed by the melted snow from Mount Fuji. The reflections of the sky and landscapes make for a perfect photo opportunity. You’ll then drive up Mount Fuji to the 5th station at 2,300 metres, before taking a ride on the Ropeway cable car (weather-permitting). 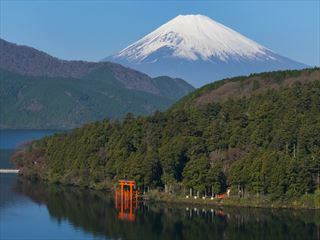 Then travel through the breath-taking Japanese Alps to the beautiful hillside town of Takayama. This evening you will enjoy dinner at your hotel. 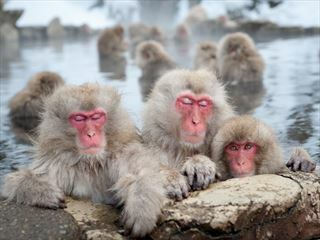 Take a step back in time to the peaceful mountain village and UNESCO designated site of Gokayama. You’ll see unique Gassho-zukuri wooden houses which have steeply sloped thatched roofs resembling two hands together in prayer. You will visit one of these houses and meet the family. Later watch local artisans making washi paper and try your hand at making your own. Today you will enjoy a cultural lunch at a local restaurant of Japanese Hida beef – the name given to beef from a Japanese black-haired cattle breed, and known as one of the finest varieties of beef. This afternoon enjoy a walking tour of the Edo-style streets of the Old Town, shopping en route to sample Japanese sake. Travel to Kanazawa and discover the secrets of gold leaf painting – 99% of Japan’s high quality gold leaf is produced in the area. 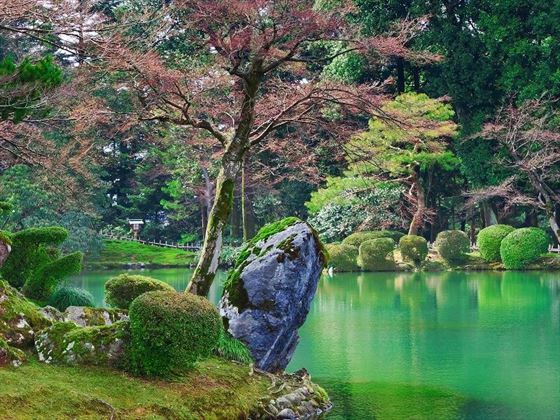 Next visit the gardens of Kenrokuen, rated in the top three most beautiful gardens in Japan. Enjoy a leisurely stroll around the ornate landscapes, temples and ponds. Afterwards, take a walk through Omicho market to see the local fish catch and enjoy an insiders view of everyday life in this vibrant coastal town. Later visit the Nagamachi District with its old and beautifully preserved samurai houses. Visit the Nomura house, an elegant samurai mansion with beautiful small gardens belonging to a high-ranked samurai family. a d nestled in the peace and quiet of Mount Yoshida. The ryokan was built in 1932 by master craftsmen to serve as the second residence of the uncle of the current Emperor of Japan. Learn about local Japanese customs as your hosts welcome you into their beautiful home. After lunch visit Kinkakuji Temple, a UNESCO World Heritage Site famous for its Golden Pavilion, built in 1397. Later check into your hotel in Kyoto for a relaxing evening. Visit the Fushimi Inari Shrine and see the tunnel of thousands of bright orange torii gates, snaking through the forest up into the mountains. Then you will visit the Sanjusangen-do Hall, a temple famous for its 1001 statues of Kannon, the goddess of mercy. Afterwards enjoy a walking tour of the Gion area. Then you can either choose to stay in Gion to explore further or return to your hotel. This evening join your Tour Director and fellow travellers for a farewell dinner at the Ninja Kyoto restaurant. Venture into the mysterious labyrinth and secret fortress of the traditional Japanese heroes, the Ninjas and experience the creative Ninja-style food. Transfer by airport shuttle service to Kansai International airport or Osaka Itami Airport for your flight home. 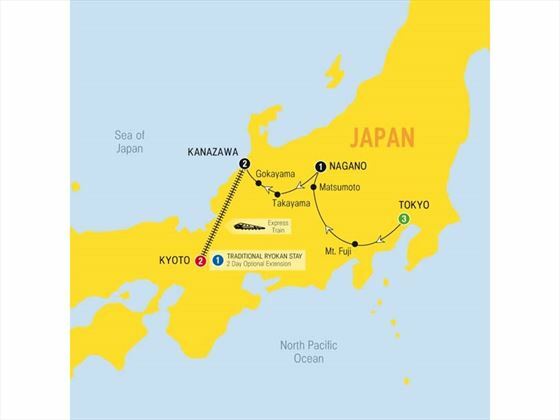 Or you can choose to extend this tour with a four day trip to Hiroshima. Please ask for details. Please note that transfers to your UK airport are available at an additional cost, please ask for details.